The Tandem Cascade Public Address System is a revolutionary new directional public address system that projects 150 dB of clearly intelligible voice and penetrating alert tones. This system is configurable and adaptable for nearly any mounting environment and is ideal for indoor and outdoor use. To achieve a wider broadcast area, the Tandem Cascade Public Address System can be set in array with other tandem cascade public address devices, and with a weight of only 20 pounds, the Tandem Cascade Public Address System can be installed in place of most existing public address systems without additional structural reinforcement. 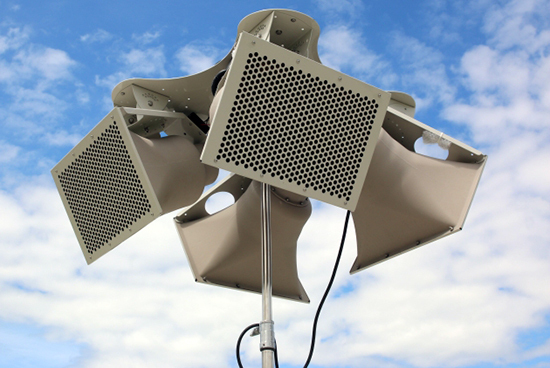 The Tandem Cascade Public Address System is both modular and light weight, allowing the end user to select from other tandem cascade public address horn configurations to construct a system that will yield the desired output and dispersion for the situation, and install these systems into environments where weight is a concern.